I hope that the various papers which I have sent to various Ministry offices have already been forwarded to the Committee by those concerned in an effort to find the truth about BSE and its expensive consequences. From those papers you will note that there are several areas which give cause for considerable concern. They include Causation of BSE, Prion Theory, Implementation of feed and Beef controls, Imported meats, Official response to those with alternative theories, Possible common causes of BSE and NvCJD, and the known effects of cumulative nerve toxins in the food of animals and man. I must declare an interest. For over 20 years I was responsible for a closed dairy herd of British Friesians which was, we were told, unique in the area in that as an Elite Herd it was tested free from EBL, IBR and Leptospirosis and had never had a case of BSE at the time of the sale in November 1991. The good health status of the herd was presumed to be the combined result of our feeding and breeding policies. The herd diet was based mainly on home grown silage, hay and straw supplemented by home grown barley and a small tonnage of protein concentrate used to boost the protein content of home milled and cubed feed nuts fed at just 1.25 tonnes per cow per year. No animal would have received more than a few pounds of the protein supplement annually. None of the supplement was stored for long periods. All feed stores were completely emptied and fumigated during the period June to August every year. No sheep or cattle other than our own home-bred cows and calves were permitted on the farm and all breeding cows and heifers were served 100% by artificial insemination. Despite this within 14 months of the sale at least 3 animals were confirmed as BSE+ve and one of those was born after the ban on the use of meat and bone meal in cattle feed. The Ministry vet declared over the telephone that the calf food had been responsible but OUR RECORDS WERE NEVER CHECKED. I understand from others that details of feeds used are never checked and are often inaccurate. I questioned the wisdom of the MBM feed theory at the time because a local farmer suffering BSE losses had never fed calf food concentrates. My questions went unanswered which I have since found is the usual approach. CAUSATION. The Steam Rendering process could never have reached the temperatures of 1500C at which the prion is said to remain intact. Similarly the solvents used to extract fat could not have removed any prions from the nerve tissue within the bones. Despite this cattle and other animals have been fed meat and bone meal and slaughter house tankage since the last century without inducing an epidemic of BSE. The failure of the scientists involved to recommend restrictions of sheep meat at the time indicates in itself that Scrapie was not regarded as the cause of the BSE outbreak. In fact in 1995 a government official reported to me in confidence that a chemical cause was suspected and that the feeding of MBM was thought to be an unproven theory in official circles. Continuing incidence of BSE cases supports this. PRION THEORY. The Journal Scientific American reported questions surrounding prions in January as did a report in the 24th January edition No. 2118 of the New Scientist. Belief in the "Infectivity" of prions is encouraged but the prion is inert and the means of its replication is claimed to be not understood. I suggest once again that the miss-folded prion is both formed and replicated by the essential enzymes in the body which both form and replicate all proteins. The prion is miss-folded as the result of enzyme corruption by chemical action. Once formed, or artificially introduced into the animal, the natural enzyme replication processes will ensue forming BSE or NvCJD or many other nervous system disorders. It is claimed that the blood brain barrier will protect the brain from chemical induced damage but these chemicals can adversely effect the enzymes which are involved in the basic ATP / ADP energy transfer process. Anyone who has had a PETT scan will know that radioactive glucose injected into the arm is readily absorbed by the brain. The enzymes involved must by definition also cross the blood-brain barrier, taking their corrupting, bonded chemicals with them. Those same chemicals may also have corrupted the anti-body producing enzymes of the immune system resulting in their failure to destroy any deformed cells which may result. Professor John Collinge himself reported that CJD begins at the nerve synapses in the brain, [the very target of these chemicals] and that the [unstimulated] cells then die forming the lesions of CJD. We have recognised the target and know the most likely enemy yet refuse to recognise the cause. No explanation has apparently been offered by the prion theorists for the thousands of BSE-ve animals who show all the signs of BSE but have not shown the lesions in the brain despite similarity of symptoms. IMPLEMENTATION OF FEED AND BEEF CONTROLS. Controls have been at best haphazard and at worst unscientific. Good stockmen can spot an animal which is off-colour within minutes of entering the yard and it would be foolish to assume that all suspect animals are reported to the authorities. Threats from politicians to keep the ban in force will not encourage hard pressed farmers to risk their livelihoods by reporting new cases in their herds which will only result in the culling of more cohorts. Those who introduced the cohort scheme seem to have forgotten that farmers buy their feed and it is then fed to all the stock on the farm and not just to those born in the same year. It suited the politicians to restrict the cohorts to those born in the same year. The real world does not always fit theoretical argument and this is especially so when those producing the theory do not fully understand their subject. Farmers with Born-after-the-ban animals have been accused of stock-piling banned feed but no such accusation was made against those at the experimental, all forage fed herd, in Ireland when the herd was destroyed after a 4 year old animal contracted BSE. Cattle feed is not stable and cannot be stored for long periods without becoming mouldy and inedible. The idea that farmers stored feed is preposterous. Beef from cattle over 30 months old which was processed before the ban was never recalled except in some cases involving exported carcasses. It was reported that some were re-imported and legally sold in Britain because the animals were killed before the ban was introduced but such animals were killed at the time when the claimed BSE "infectivity" was at its peak. No processed meat was ever recalled by government. Not even that which contained the suspect material and mechanically recovered meat. This infers that there was no perceived risk from eating such material. The latest ban for meat-on-the-bone raises further questions. The Minister refers to the small quantity of meat sold on the bone as a reason for his lack of concern but he misses the point. If bones present a risk they should be disposed of in the same manner as the rest of the risk material. Meat and Bone meal has been disposed of in landfill sites. Those who questioned the wisdom of this action have been told that the meal is from cows free of BSE and there is therefore no risk of the "infectious" prions entering the ground water supply. Only beef under 30 months is now legally sold in the UK. Such meat is from animals said to be free of BSE and yet their bones are said to present a risk to health. The very bones which are not treated as specified material and which are dumped as landfill. IMPORTED MEATS. Imported beef replaced home produced carcasses. In August 1986 a Veterinary officer published warnings about importing meat in our local ADAS Publication "Progress". "There is a real risk that they may carry infection which could cause serious disease" he wrote, referring to swine fever, and foot and mouth disease, but it is clear there are many others. An import licence carrying a veterinary health certificate was he said necessary before importation of meat and animal products including eggs. Individuals could only bring in up to 1 kilo of boneless or fresh meat products and all meat such as sausages, ham, salami had to be declared to customs. The advice was not to bring in foreign meat. Standards appear to have been lowered to support the prion theorists who know very well that the controls on BSE in the rest of Europe are not to the standards imposed here in Britain. OFFICIAL RESPONSES. There has been a persistent denial that any cause other than scrapie may have been responsible for this financial and moral disaster. The Organophosphorus (OP) theory has been denied a proper airing by those who have need to hide the possibility. It is claimed that herds on farms which do not use OPs have suffered from BSE but I would suggest that many farmers have no idea if the chemicals they are using are OPs or not. These chemicals are everywhere in the modern world and are now almost impossible to avoid in our daily lives. They are found in feeds, water, wormers, and fuel and there is the ever present risk from spray drifting onto the grazing animal from neighbouring farms. Furthermore I have personally given evidence to the government and the regulatory bodies which proves beyond doubt that we have all been misled by the chemical manufacturers on vital safety aspects. To date the attitudes of the officials concerned remain unchanged and no restrictions on the incorporation of these chemicals into food have as yet been introduced. Those who question the official line are ignored. POSSIBLE COMMON CAUSES OF BSE AND CJD. It would appear that SEAC and others will not consider the possibility that BSE and NvCJD may be caused by a common triggering agent and instead persist in promoting the idea that BSE caused NvCJD as the result of eating "infected" beef. I am deeply concerned that practices used in the 1980s involving cattle feed are now being promoted for use in the human food chain. If those practices caused BSE in cattle then it is very likely that if the method is introduced for human food then NvCJD cases may well reach epidemic levels. The danger signals have already been seen. When a vegetarian contracted NvCJD the response from SEAC was not to question their theory but instead to exaggerate the supposed risk from eating beef in early life. If that was true we would all have NvCJD but SEAC seem content. THE EFFECTS OF KNOWN TOXINS. The chemicals to which I refer are known to present a risk to human life and are present in our food not merely as the residual level from some field spraying operation but in some cases they are effectively deliberately added to otherwise wholesome foodstuffs. All inhibit or corrupt enzyme processes. Government papers dating from decades past confirm this as a known and unarguable fact as is the danger from cumulative small doses and the increased toxicity which results from multiple chemical exposures. Manufacturers make full use of the latter fact in their formulations and it is clear that the solvents and surfactants used are employed to enhance toxicity. ACTELLIC PRODUCTS for example present an obvious risk to both animal and human health. The manufacturers now recognise this fact by warning farmers not to contaminate foodstuffs with the chemical and yet it has been sold to farmers for over twenty years for incorporation into grain which is the staple diet item for humans and cereal fed animals alike. It is licensed precisely for that purpose. Errors in the evaluation document published only last October have been admitted as has the lack of clarity in user instructions but it is clear that the known dangers to human life have been ignored or suppressed. The Document admits to gaps in knowledge and calls for more research into vital safety areas despite the safety claims made over the past 25 years or more. However it does recognise that the chemical can damage nervous and reproduction systems and has been proven to mutate bacteria. Moreover it is admitted that the chemical degrades "slowly, if at all" when incorporated into grain. As pointed out to the PSD the majority of tests referred to are of short duration and are followed by a rest period but in the real world there is continuous exposure and the unregulated incorporation methods result in wildly fluctuating application rates. It has been reported that double rates are often used and furthermore that the chemical is actually added to flour in the course of certain commercial baking processes which would effectively increase the incorporation rate once again. It is no surprise therefore that the British Medical Association reported high levels in baby�s rusks and that some beers made from treated malting barley might have an "unexpected extra kick". More worrying is the fact that the document reports that the chemical mutates salmonella typhimurium. The gut must contain the chemical since it does not degrade in grain. Given that enzymes have been shown to be active at concentrations as low as 1 part in 25,000,000 it is likely that any Salmonella present in the gut could undergo mutation into a new strain. One such new strain was reported recently as being found at increasing levels in all farm animals and at a 10 fold increased rate in humans since 1990. It is resistant to most antibiotics. The danger from this chemical should be obvious but the government does nothing despite the fact that the presence of such chemicals in the diet of cattle may well explain the origins of BSE when viewed alongside the use of related chemicals on the backs of cattle. SYSTEMIC OP WARBLECIDES. These systemic OPs were poured on the backs of animals despite the admitted risks to the health of cattle. Such actions have the same effect as injecting the chemical into the bloodstream and the entire animal becomes toxic to the insects within it. The 13th Edition of Black�s Veterinary Dictionary 1979 spells out the risks which were accepted by government. It reports that even cattle for slaughter had to be treated first with warblecide and should have documents to prove that action. This together with freshly treated casualty cattle and freshly dipped casualty sheep would result in OP contamination of meat and bone meal which would later be fed to the cattle. Moreover one of the recommended methods of disposal of spent sheep dip was to spread the diluted chemical over land which may later have been grazed by cattle and recent experience with the newer formulations suggests that water courses and therefore their drinking water may also have been contaminated with OPs. All these problems are the result of government advice and regulations. GLYPHOSATE. Recommendations for use were changed in the 1980s when these products were cleared for use on grain crops pre-harvest and even on grass which would later be grazed or conserved as silage or hay. Prior to this they were used only to destroy weeds and old pasture which would not then be consumed by animals or man. Greenpeace reported recently that the chemical has been found at residual levels in vegetables grown in soil which grew crops treated with glyphosate in the previous year and the manufacturers are reported to have been forced in the USA to withdraw claims that it is biodegradable and environmentally friendly. Now human as well as animal foodstuffs contain this systemic OP which is reported to inhibit enzymes linked to amino acids in plant and though claimed not to effect man poisonings have occurred and the suggestion that the surfactant used is responsible is by no means certain. In fact no laboratory test can mimic the situation in the field exactly because it is not possible to measure the effect of chemical combinations. Though not officially recognised there have been many reports of ill-health as the result of exposure to glyphosate. In the light of the above it would be unwise to assume that the information provided by the manufacturer is reliable especially since the chemical was recently acclaimed as a possible treatment for cancer. By definition this requires that the chemical can react upon human cells and must therefore present a degree of risk to the enzyme processes within our bodies and that of the cattle which became unwitting participants in experimental feed trials since the 1980s. OTHER EXPOSURES. As if the above was not enough to cause BSE in cattle they were also subjected to a chemical onslaught from the cumulative and irreversible pyrethroids in fly control ear tags and sprays which are now proclaimed to be more environmentally dangerous than are OPs. Strange then that the Ministry licensed them as the "safer" alternative to the OPs used in sheep dip. SUMMARY. Despite the claimed priority to protect human health and the ever desperate measures used to maintain the "official" line as regards the prion theory it is clear that vital information is being deliberately hidden. Should the "infectious" prion theory be correctt the policies followed may even now have increased the risk. Fortunately the theory does not survive close scrutiny even on its basic claims. It is clear that commercial and political pressures have taken control. The government fears the costs of compensation both to the victims of NvCJD and to the manufacturers of the chemicals. In no other industry is the manufacturer compensated when goods produced are shown to be dangerous. With these companies however they must apparently be paid compensation not only for the value of any banned chemical remaining unsold but also for the potential profit lost. Over the years they seem to have gained control of the regulatory bodies by careful placement of personnel. I can see no other explanation for the refusal to recognise obvious ill effects from these chemicals. In many cases the same faces are seen on the panels of experts who determine safety levels and those who adjudicate on poisoning cases. The conflict of interest is obvious and extremely dangerous. We must ask why our government approves of this. I have myself been disabled, Poisoned by the OPs added to grain. I have evidence to show that there has been a deliberate falsification of facts designed to protect the chemical companies and government. I hope that this submission will help reveal the truth. There is no doubt that the issues involved are extremely complex and the various interactions are so varied that the conclusion that feeding meat and bone meal alone is responsible for the BSE epidemic must be a simplification beyond belief. To then suggest that not only did eating beef cause NvCJD but that "eating cheap burgers" could be responsible has taken scientific thought beyond reason. The same mechanically recovered meat found in burgers could have been used in pies, soups and tinned and pre-prepared meals. None of these has been accused and not one ounce of such products was or has been recalled by government despite the long shelf life of tinned meats. The following papers give an indication of the feeding policy on one farm. Products used and quantities fed varied from year to year and the same situation will be found across the country. It is probable that human exposure to chemical pollutants in food and the environment is as high as that of these animals, despite what appears on these pages for animals do not drive cars in traffic, wear perfumes or paint houses etc etc. Also, unlike some humans, animals do not voluntarily partake in the use of illegal drugs simply for kicks and this risk factor cannot be implicated in BSE causation. Although as in humans they require medical treatment with prescribed drugs for occasional ills farmers would, unlike medical doctors, be prosecuted for failing to provide the right diagnosis and treatment for their sick animals. I hope the following information is helpful. First I must point out that the information provided is as detailed as it is possible to be but there may be important omissions such as antibiotics and anaesthetics used. Unfortunately some records were destroyed by temporary staff who did not value such information but it has been possible to build a more complete picture from my own reasonably detailed records. 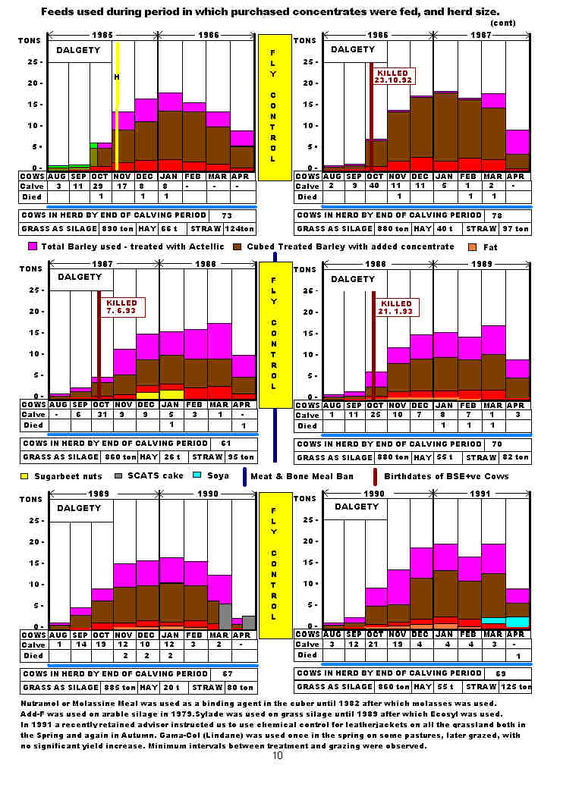 The numbers given for cows in the herd on the following graphs do not include those who remained in the herd but were barren and intended for sale during the course of the year. The numbers given are for calvings which resulted in cows entering the milking herd and indicates their fate. Time and space prevent a full list of stillborn calves etc. HISTORY. The herd was long established but was reformed following the Foot and Mouth disaster. When I joined the farm in 1971 it was managed jointly with an adjoining farm, the second such partnership in the recent past. The herds were milked separately but the youngstock were both grazed and wintered together on this farm. The practice at the time was to calve at 3 years of age and the animals spent the summer months grazing fields of some 75 acres 20 miles distant. Farming was more basic then. Silage was fed manually using knives and hand forks, milk was in churns, chemical use was minimal and any warbles which appeared in the backs of cows were squeezed out and crushed on the floor. Hay was a major part of the diet and all the anim s were housed in loose housing during winter using large quantities of straw as bedding. Some of the barley grown was rolled and fed to the animals but most was sold. Commercial cattle feed was used. A Hereford bull served the heifers and cows were artificially inseminated. In 1972 a milling machine and cuber was installed and the cows were then fed large tonnages of home grown barley processed into cake fed to both herds using purchased protein supplements and minerals. In 1973 the milking cows were moved to cubicle housing which created problems with slurry and resulted in a severe mastitis outbreak. E.Coli killed one cow within hours. 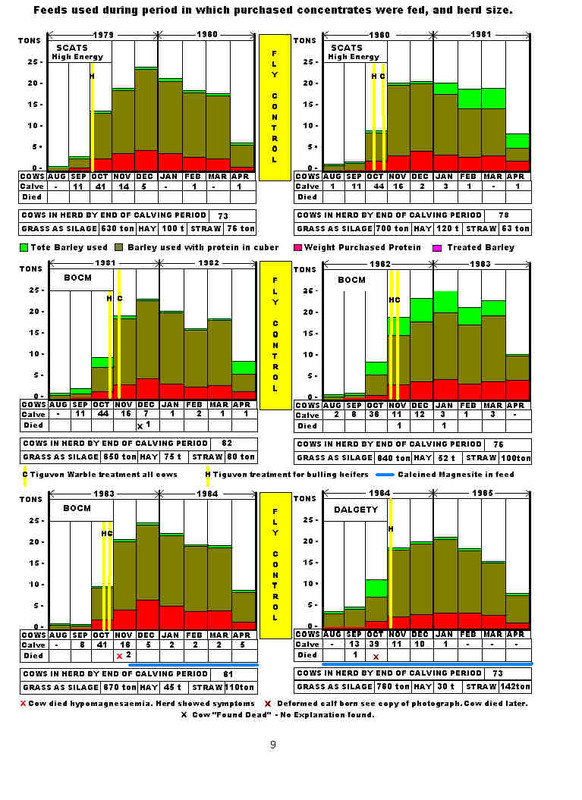 The design was changed and new work practices introduced which reduced the incidence of mastitis to almost nil. Kale and rye were fed to both herds by zero-grazing methods using the newly introduced mechanical silage feeder. By 1975 the heifers were also artificially inseminated using Estrumate for heat synchronisation but a bull was used to aid the fertility rate. The husk vaccine Dictol was used to protect the calves. The heifers were treated for warbles for the first time according to my records in December 1976 and the vet was asked at the time what the dangers of the chemical were. He did not appear to know. Due to the drought of 1976 barley was short and the cows were fed SCATS commercial cattle cake. In 1977 a fertility problem arose which appeared to have no obvious cause. A Phosphorous imbalance was suspected and treated using High Phosphorus minerals but the problem persisted and an apparent shortage of energy, despite adequate rations, was overcome by the use of a specially formulated high energy SCATS concentrate which contained fat but the original fertile state of the herd was not achieved until we fed a specialised high copper, high manganese, high phosphorus mineral produced by Upjohn, Tuco JGW 438. In May 1978 the two farms parted company and we then ran the farm as a completely separate unit, still retaining the outlying grazing land for the youngstock and haymaking. On taking responsibility for purchasing the protein for the cows every supplier was approached and asked to provide details of the content of their concentrates. All refused to do so stating confidentiality and commercial competition as the reasons. Only one would say what was not put in the ration but named only sawdust and straw. We remained supplied by SCATS until 1981. We reared some animals to sell for beef and so stayed with the dual purpose British Friesian breed as much as possible using Herefords on poorer cows. Tiguvon was used as the warblecide every year applied by the cowman using gloves as recommended. He also used Louse powder which contained Gamma HCH (Lindane) on a regular basis and formalin mixtures for controlling foot problems in the cows.Calves were reared on milk replacer powder, Quicklettes and Rearing nuts with hay and straw and, when weaned, barley with some of the herd concentrate and silage. Financial restraints demanded that we relinquished the outlying land and the new bull was disposed of when he introduced an infection into the cows. Using more efficient methods production on the farm was raised far above the previous levels with limited reliance of chemical sprays but greater use of fertilisers and a more intensive grazing and conservation system. The figures for hay and straw given later reflect the quantities available at the start of the winter and not the amounts fed. Some would also have been sold in good years. From 1979 the herd was closed to all outside stock and grass, hay, straw, silage and home grown barley became the major part of the diet of all the animals on the farm. Heifers now calved at just under 2 years of age at a larger size and in better condition that they had at 3 years. Silage alone provided the nutrients for rapid growth with barley only fed to bulling animals at service time to provide the extra energy required. We had wormed the youngstock several times a year but now used silage fields as clean grazing areas and changed from the injectable anthelmintics Nilverm and Nemicide to minimum use of Panacur Drench. The cowman sprayed the cows and heifers in the summer about once a month with Disect (cypermethrin) to control flies and prevent summer mastitis which had been common in the wooded areas of the farm. Later he used Fly tags in ears of the calves which contained the same chemical. Silage production increased with earlier cuts so that we achieved 4 cuts of silage and one late cut of hay from every acre of outlying grass every year. Different additives were tried, Add-F, Liquid Kylage, Sylade and finally Ecosyl. Much depended on the reliability of the silage as it was the major item of the diet. In 1981 the feed supplier was changed and BOCM concentrate became the protein source. The cows were treated with warblecide on the 9th November. On the 9th December a cow was found dead with no hint as to the reason. Cause of death was not determined. On 24th October 1983 the cowman treated his cows with Tiguvon as usual. In the following weeks they seemed to be jumpy and "on edge". On the 11th November one cow went down with Hypomagnesaemia. It was treated and checked by the vet but went down again breaking a hip. It was destroyed and as a preventative measure Calcined Magnesite was added to the ration of all the cows ever afterwards. Feather meal was discovered in the protein concentrate. We were informed that it should have been ground down so fine that it could not be noticed. Apparently feather meal analyses high in protein. We changed suppliers to Dalgety who also supplied the calf food in the form of Denkavit milk powder, Cudlets, and Coarse Mixture Concentrate for addition to barley. On 20th October 1984 the vet was called to an unusual calving. After attempts by him to use a calving aid it was decided to operate. 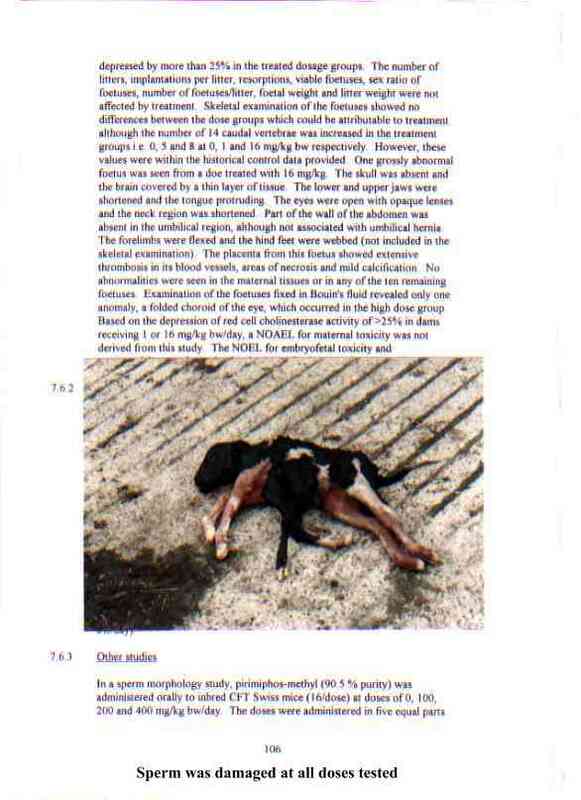 The caesarean resulted in the birth of a deformed calf (see enclosed photograph super-imposed over a page from the Pirimiphos Methyl Evaluation Document which shows that even that chemical can induce defects). The calf was normal at the head and forequarters. The spine split to form two male hindquarters though one was much smaller than normal. The stomach was open at the umbilical cord with the intestines able to spill out - exactly as described in the document. We had all been fooled by the normal head and the fact that the calf had appeared to be alive. Peritonitis killed the cow. Quotas were introduced, restricting income and based on one of our lowest yielding years. To cut costs JGW minerals were replaced by copper injections and the addition to the ration of a small amount of manganese sulphate which was said to be equally as good. During the 1985 harvest the grain bins collapsed. The cowman helped us erect new ones and fill them but was unwell. In October the barley had become infested with mites which were resistant to the Actellic D spray which we were recommended to use in conjunction with a surface incorporation of Actellic Dust. A further application of Actellic D was recommended but though it adversely affected my health the bugs seemed to thrive and a further application to the bin structural surfaces was recommended. With careful ventilation which had a fumigating effect the problem was reduced to manageable levels and Actellic was then added to every grain harvest. In retrospect the cows would have been exposed to very high doses as the bins were emptied. The sweepings from the floor would have contained considerable quantities of the chemical. Since we were informed that the chemical broke down to safe levels after addition to grain the risk taken in this practice was not realised. Now we have proof that not only does the chemical not break down but that it remains toxic for many years and has proven mutagenic properties,especially at high dose. The cowman may have warbled the cows before we treated the heifers on 6th November 1985. We do not know. He was diagnosed with lymph cancer and on the 11th November went to hospital. Lymph cancer is apparently a recognised Occupational Hazard in Agricultural workers in the USA. His illness proved horribly fatal though he managed to return to work for a short time before a relapse. The health of the herd also deteriorated. Some milk fevers were difficult to cure. Cows suffered stomach cancer, liver failure and anaemia with no indication of cause. At one time deliberate poisoning by rat bait was even considered. Still born calves were common, infections increased, some were born with obvious lack of control over their limbs, often dying in the early weeks after birth. One was born with a cleft palate. Fertility problems returned and again an energy deficiency was suggested despite the adequate diet. In 1987 expert advice was to feed sugarbeet nuts and hay in efforts to encourage the guts of the cows to make better use of the dietary energy available to them and so aid fertility. The experiment was a dismal failure with a rapid drop in milk yield and so was quickly abandoned. In May 1988 a temporary cowman was caught attempting to spray the cows with neat Disect using an old "Flit Gun" sending an aerosol spray of chemical across their backs. Since he wore no upper clothing at the time in retrospect it is fairly obvious why he later suffered with sickness and stomach upset. The cows appeared to show no ill effects and it was hoped that he was stopped before any damage was done. Most of the farms around us had suffered cases of BSE. Leptospirosis on a neighbouring farm had almost killed our relief milker. Our freedom from both diseases was assumed to be due to our feeding and breeding policies. All those with high levels of BSE seemed to be high yielding Holstein herds which fed in excess of two tonnes of bought in protein per cow per year while those with leptospirosis had allowed sheep to graze their pastures which had moved from farm to farm probably bringing the illness with them. In July 1988 the Government banned the use of meat and bone meal in cattle feed. In efforts to avoid the energy problem in the following winter additional fat was fed in the rations but 1989 an arrangement was made with a local supplier to provide a high copper mineral which contained additional phosphorus and manganese in efforts to improve the fertility levels. Serious problems with rabbits breeding on Forestry Commission land resulted in the total destruction of a large area of the Winter Barley crops upon which we depended. After the loss of almost all the yield from 17 acres in 1989 and the continuing and futile battle regarding liability with the Forestry Commission it was necessary to buy in a quantity of SCATS cattle cake in the spring of 1990. Calves were fed with Calf Pride Pencils and the beef with straw and Provitlic, a urea based liquid feed. The herd was blood tested for Elite herd status and shown to be free of all the major diseases. In the summer of 1991 all the animals were sold to a mainland farm. Three BSE+ve cases were confirmed by the ministry vets in 1993. The sale of the cows must have made their task more difficult but after asking for details of feeds used over the telephone the Ministry at no time checked the accuracy of what information I was able to give. It was my belief at the time and it remains the case that the animal born on this farm after the ban disproves the meat and bone meal theory unless it is admitted that a predisposition to BSE is inherited or that the feed manufacturers sold material knowing it to contain illegal ingredients. The first would be disaster. The second should result in prosecutions. Neither can be blamed on the farming community. ADVICE. Since the Ministry of Agriculture was formed farmers have been bombarded with advice in the efforts to increase production. To stay competitive many have had to keep up with modern and unproven methods which have far reaching environmental effects. It is the large farmer who can buy cheaply in the market place while his smaller neighbours have little commercial influence over costs. The chemical spray is cheaper and quicker than the hoe and needs many times less labour. As a result farms and fields grow ever larger, soil and wind erosion become common place, ditches are neglected and filled and hedges become as rare as farm workers. Fewer workers mean more reliance on chemicals and bigger machines which in turn reduce the opportunities for sales, fewer suppliers, fewer mechanics, contracted industry. On the animal side the situation is worse. Units grow ever larger, waste disposal becomes a major pollution issue, disease is spread more rapidly and feed compounders have to be more competitive. And there I believe lies the key to BSE. Cheap ingredients are required. Grain screenings and food unfit for human consumption must be tempting offerings. The Maximising Profit motive lies behind the disease whatever its cause. On expert advice the rendering process was changed, to increase profit. It cannot be responsible for the outbreak but nevertheless the risk was ignored. On expert advice cumulative nerve poisons were permitted in animal and human foodstuffs for insect control despite warnings, to increase profit. Warblecides were permitted in order to save parts of just 20% of hides despite the known risks, to increase profit. Genetic Engineering which is already proving unreliable with reports that seeds have been recalled because they have the "wrong gene" implanted is accepted despite the risks, to increase profit. Now expert advice bans British beef on bone but imports beef which does not meet our standards. The government has encouraged the widespread use of chemicals in all industries and we begin to see the results. The best advice they can offer seems to be that there is no proven risk which contradicts their own research and technical documents. This farm used many different pesticides but that use was limited to the need to produce a reasonable yield in crops which were clean enough to harvest and feed to our cattle. Insecticides were used in times of dire need or when to avoid them would result in crop failure. We trusted in claims that the chemicals were tested and proven safe. As time progressed we realised with some anger that the chemicals which we had been advised to use without protection for many years now required by law the use of protective clothing. When that too was said to be not of the required standard it became clear that we had never been properly informed of the risks. Even now the government advises that these chemicals are safe to use because to do otherwise would be financially dangerous. Their advisors seem to ignore the fact that the entire population can be at risk if they ignore the truths which are there for all to see. The BSE crisis illustrates this perfectly In my research for my own OP poisoning illness I discovered that the chemical interferes with the energy transfer process in the body, that free calcium in the diet such as that found in fodder from alkali soil such as ours of pH 8.5 and the magnesium found in the calcined magnesite can all offset the effects of OPs. Some even claim that copper plays an important role in alleviating poisoning symptoms. This may go some way to explaining the problems experienced which are illustrated here. The argument that those poisoned by OPs do not then go on to suffer CJD cannot be used to dismiss the possible link to BSE since the true nature of the cause is not properly understood. Strangely it seems that low levels of toxins have found to cause greater health problems than high doses. Chance effects within the enzyme systems may be involved. If nothing else is certain there is no doubt that the dangers of OPs have been hidden by officials. Without truth and accuracy science and the statistics on which it relies are nothing.